Reviews Readers who were enticed by the first volume will gobble this one up and probably mark their 2013 calendars with reminders to order volume three. It s that addictive, and, thankfully, also worth the effort. ForeWord Reviews Amanda Havard spins a rich story that's rooted in history, but teeming with all our favorite myths and legends. 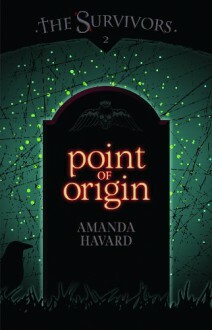 The Survivors: Point of Origin is a wild ride, beautifully written and wonderfully told. --Brittany Geragotelis, author of the Life's a Witch series Filled with colorful characters, romance, and a fascinatingly rich mythology, Point of Origin is one heck of a read! I couldn't put it down and now I'm left wanting, no, needing the third book! If you haven't started this series, do so immediately! Once you start, you won't want to stop. -DJ DeSmyter, author of Hunted The book you're holding in your hands is chock-full of the Good Stuff. Don't waste any more time reading this blurb; head directly to the checkout, do not pass Go, and start reading the stuff between the covers immediately. -Rodger Nichols, Haystack Broadcasting Point of Origin is astounding. That's the best word to describe it: astounding. -Kallie Mathews, Bookshelf Banter Review Direct Title of Special Note The winter is upon us. The Survivors are in chaos. The war is coming. One year ago, Sadie Matthau was living among humans, existing as one of them. But now she wakes each morning in a house in the Survivors City, listening to the invocations and insults of her family members as they cope with their new future. A war. Rogue abandoners turned monsters. Sadie and the icy Winters living in their midst, bringing the outside world in. The Survivors: Point of Origin is Sadie's quest to save her family. But can she find what she is looking for when she can barely stomach the Winters wintry demeanor and finds herself distracted by Cole Hardwick s warm heart? Will she be able to uncover her family's history even as the elders grip tightens around her throat? In an action packed ride full of magic and misery, terror and triumph, Sadie Matthau seeks the Survivors beginning just in time to face her end.